Julian Treasure takes the stage at TEDGlobal 2009, sharing the shocking fact that — when you can hear others talking in an open office — productivity dips by 66%. Julian Treasure cares very deeply for your ears. That’s why he’s given TED talks like “The 4 ways sound affects us” and “Why architects need to use their ears.” Treasure is on a mission to make policymakers, engineers, architects and, well, Julian Treasure: Shh! Sound health in 8 steps everyone think more about what they hear around them — because the way things sound have a tangible, measurable effect on how we feel, how we heal, how we work and how we live. Read the paper in full, or check out some of the most fascinating facts below. The estimated cost of noise pollution is $30.8 billion a year — and that’s just in Europe. The World Health Organization Europe’s 2011 report, “Burden of disease from environmental noise,” analyzes the relationship between environmental noise and health. In this study, they calculate the financial cost of lost work days, healthcare treatment, impaired learning and decreased productivity due to noise. The total they came up with is staggering, considering they’re looking at just one continent. Each year, noise pollution takes a day off the life of every adult and child in Europe. This same study also looked at the cost of noise pollution in terms of lost life expectancy. Shockingly, they determined that every 365 days, one million years are taken off European’s collective life expectancy — averaging to a day per person. If you can hear someone talking while you’re reading or writing, your productivity dips by up to 66%. Open floor-plan offices distract workers without them even noticing it. In a classic study published in the British Journal of Psychology in 1998, researchers found that employers were highly distracted when they could hear conversation around them, and less able to perform their duties. Another classic study found that noise in the office also correlated to increased stress hormone levels and a lower willingness to engage with others. According to Sound Agency case study, when sound masking technology was used in an office, there was a 46% improvement in employees’ ability to concentrate and their short term memory accuracy increased 10 percent. The average noise level in many classrooms is not just associated with impaired learning — but with permanent hearing loss. Noise can deeply affect learning too. The WHO recommends a noise level in classrooms akin to that you’d find in a library — 35 decibels. However, a study in Germany found that the actual average noise volume in classrooms is 65 decibels — a level associated with permanent hearing loss. As Treasure outlines in this talk, for a student sitting in the fourth row of a traditional classroom, speech intelligibility is just 50 percent — meaning that they only hear half of what their teacher says. A 20 decibel increase in aircraft noise is enough to delay a student’s reading level by up to 8 months. A study published in the American Journal of Epidemiology in 2006 looked at 2000 students between the ages of 9 and 10 in schools in The Netherlands, Spain and the U.K. — many in schools near airports. They found that aircraft noise was associated with impaired reading comprehension. 50% of teachers have experienced damage to their voice from talking over classroom noise. A study of teachers published in the Journal of Speech, Language and Hearing Research in 2004, noted another side-effect of noise pollution in classrooms — 50% of teachers have suffered irreversible damage to their voices. Why? Because as the environment gets noisier, we speak more loudly. The average noise level in some hospital wards not only impedes healing — but could legally require hearing protection. The WHO recommends noise levels in hospital wards to stay around 35 decibels. But a study in the US found the average noise level in hospital wards is actually closer to 95 decibels — just 10 decibels beyond the noise level at which U.S. federal law requires ear protection for prolonged exposure. Sleep is crucial for patient recovery, and yet with the constant beeps, tones and shuffling, the body feels that it is under threat. Not to mention that staff errors increase the greater the level of distracting noise. 3% of cardiac arrest cases in Germany have been explicitly linked to traffic noise. Treasure found this alarming fact in a 2009 press release from the Environmental Protection UK. Noise pollution may possibly even contribute to crime. When the city of Lancaster, California, installed a sound system featuring birdsong along a half-mile stretch of a main road, there was a 15 percent reduction in reported crime, according to an article in The Wall Street Journal. Similarly, when the London Underground started playing classical music at a crime-heavy station, robberies fell by 33% while assaults on staff dropped 25%, says The Independent. Below, an infographic further outlining the problem. Try putting soft ear plugs inside your ears and inside the headphones. It may be uncomfortable. I think the life is created by sound and everything relies on it. In education, alongside the massive social effects of millions of children leaving school without having been able to hear a lot of their education, an even more worrying fact is that long term exposure to a noise level of 65 dB SPL (the average noise level in the German study we quote and not atypical these days with constant groupwork in bad acoustics) is the threshold for producing myocardial infarction. In other words, teachers working in that environment may well be reducing their life expectancy. 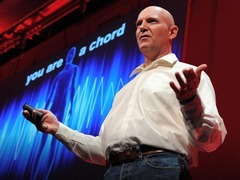 See my TED talk on designing with our ears for details. Music is a distraction to those that have more to offer. Just someone speaking softly, but still audible while you are speaking is a big distraction. Tell that to the new CEO of yahoo. Um… you guys realize db is relative right? +1200db (or any other number) can still be almost silent. Casey, you are entirely right. In the white paper itself, we make it clear that when we refer to dB, we are meaning dB(SPL) as indeed we also do in the book, but as the infographic is shown here in isolation, this is not clear. Sorry for any confusion.